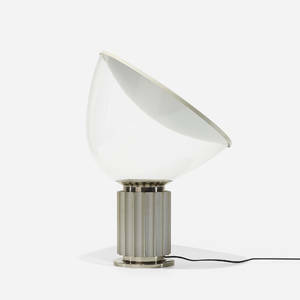 Achille Castiglioni (Italian, 1918-2002) and Pier Castiglioni (Italian, 1913-1968), "Taccia" lamp (1967) by Flos. 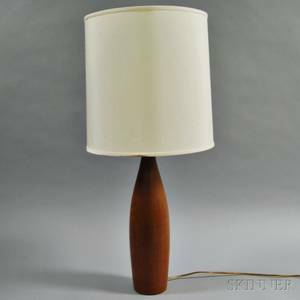 Mid century modern table lamp designed in the form of an upside down streamline hanging lamp. Deep translucent glass bowl topped with concave sheet of spun aluminum in a matte white finish. Aluminum sheet acts as a reflecting screen for the bulb which is hidden in the extruded aluminum base. 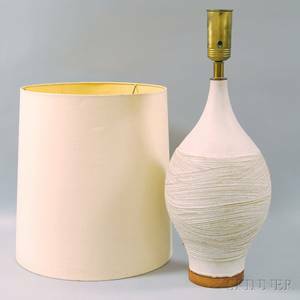 Base corrugated to better disperse the bulb's heat and effectively prevents glare from the bulb. 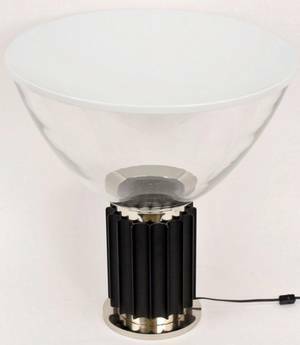 Translucent glass bowl not attached to stand and adjustable allowing for angle manipulation to alter light direction. 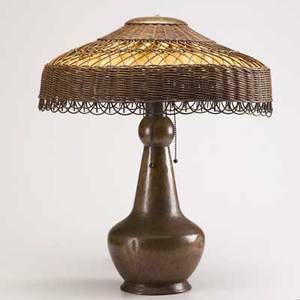 Exterior with black concave ridged decoration surrounding cylindrical shaft on circular base. Height 21", diameter 19". 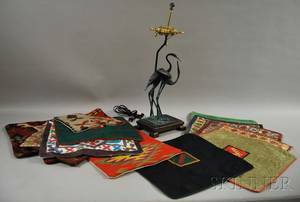 Stickley brothers (attr. 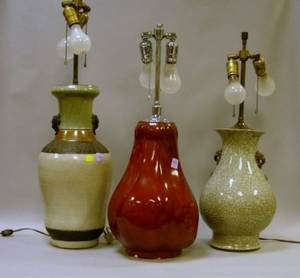 ); table lamp; hammered copper and wicker; 22" x 18"
Two Chinese Glazed Porcelain Table Lamps and a Modern Red Glazed Ceramic Table Lamp. 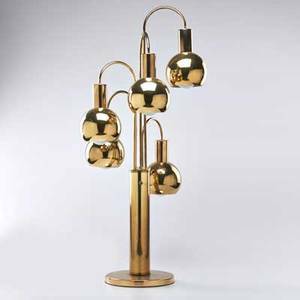 121573: MODERN DECO STYLE METAL TABLE LAMP, H 25"